Click here to download the print friendly version. This skit allows students to review the story of Judas betraying Jesus. It could be repeated more than once to give everyone a chance to participate. This would probably be best for older children, as it has some scary parts. High Priest: Think hard, guys. We’ve got to think of some way to get rid of Jesus. Priest 1: Look, it’s Judas, one of Jesus’ friends. Judas: Not any more, I’m not. What will you give me to tell you how to get to Jesus? 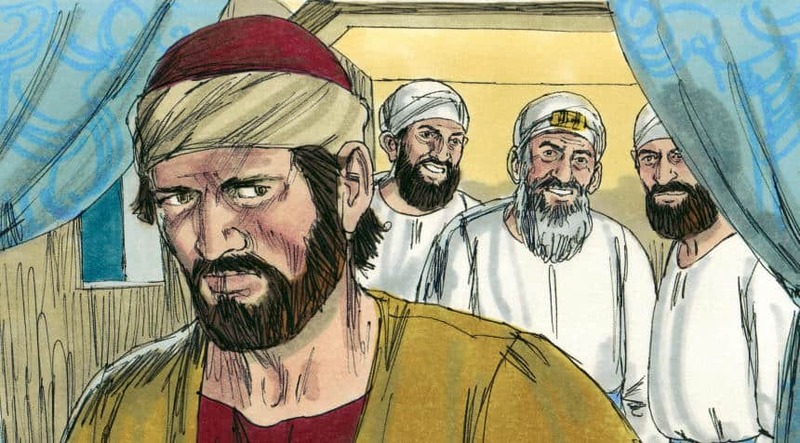 Judas: Hey, this sure beats stealing from the disciples’ money. Judas: Remember, the one I go up to is Jesus. Judas: Hello Jesus. Good to see you. Peter: I’ll save you, Jesus. High Priest: We’ve got you now, Jesus. Judas: You’re going to kill Jesus. I did wrong by selling Jesus out to you. Priest 1: We are not going to worry about that. That’s your problem. Judas: I can’t stand it. I’m going to hang myself. Does anyone have a rope I can use? Priest 2: He really did hang himself. Look at him swinging in the breeze. treasury because a man was killed for it. use it to bury people who can’t afford a regular grave. High Priest: That sounds good. Let’s do that. Tony Kummer (Editor) reviewed & updated this page on : March 25, 2014 at 10:48 am. All our content is peer reviewed by our readers, simply leave a comment on any post suggest an update.